In modern baseball history, only one team not named the New York Yankees has ever won three consecutive World Series. That team was the Oakland Athletics, who captured major league baseball’s crown each year from 1972 through 1974. Led by such superstars as future Hall of Famers Reggie Jackson, Catfish Hunter and Rollie Fingers, in the final years before free agency and the movement of players from one team to another forever changed the game, the Athletics were a largely homegrown aggregate of players who joined the organization when the team called Kansas City its home, developed as teammates in the minor leagues, and came of age together in Oakland. But it was the way in which they did it that immortalized those teams. For if the story of the Oakland Athletics’ championships is that of one of baseball’s greatest teams, it’s also the story of enigmatic owner Charles O. Finley and how those players succeeded in spite of Finley’s larger-than-life persona and meddlesome ways. Indeed, before the Yankees’ George Steinbrenner, there was Charles Oscar Finley, of the Athletics. 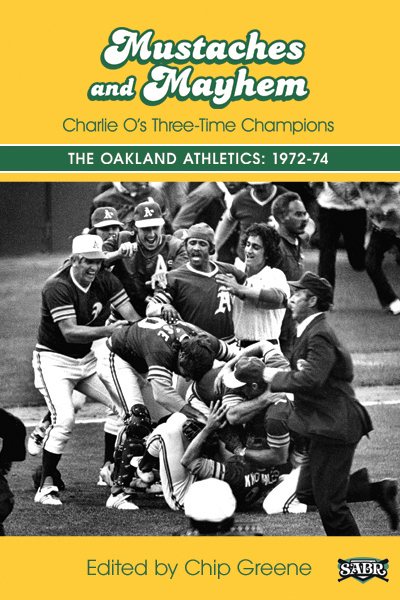 Featuring the contributions of 46 members of the Society for American Baseball Research (SABR), Mustaches and Mayhem: Charlie O’s Three-Time Champions shares the stories of each of the roster players on each of the A’s championship teams, in addition to the managers, coaches, Finley himself, the team’s radio announcer, and even Charlie O, the mule, Finley’s legendary mascot. Summaries of each spring training and World Series, too, will complete the tale of one of baseball’s most colorful and successful teams. Contributors include: Alan Cohen, Andy Sturgill, Austin Gisriel, Bill Nowlin, Charlie O’Reilly, Chip Greene, Clayton Trutor, Clifford Corn, Curt Smith, Dale Voiss, Eric Aron, Francisco Rodriguez Lozano, Geoffrey Dunn, Greg Erion, Gregory H. Wolf, J.G. Preston, Jeff English, Jimmy Keenan, Joanne Hulbert, Joe Wancho, John Cizik, John Henshell, John Vorperian, Joseph Gerard, Keith Scherer, Leonte Landino, Loretta Donovan, Marc Z Aaron, Mark Armour, Matt Bohn, Matthew Silverman, Maxwell Kates, Mike Epstein, Neal Poloncarz, Norm King, Paul Hofmann, Richard J. Puerzer, Rick Schabowski, Rory Costello, Royse Parr, Saul Wisnia, Scott Ferkovich, Ted Leavengood, Thomas Ayers, Tim Herlich, Tom Hawthorn, and Wynn Montgomery. E-book: Click here to download the e-book version of Mustaches and Mayhem: Charlie O's Three-Time Champions for FREE from the SABR Store. Available in PDF, Kindle/MOBI and EPUB formats. Paperback: Get a 50% discount on Mustaches and Mayhem: Charlie O's Three-Time Champions paperback edition from the SABR Store ($15.99 includes shipping/tax). E-book: Click here to purchase the e-book version of Mustaches and Mayhem: Charlie O's Three-Time Champions for $9.99 from the SABR Store. Available in PDF, Kindle/MOBI and EPUB formats. Paperback: Get the paperback edition of Mustaches and Mayhem: Charlie O's Three-Time Champions from the SABR Store ($30.99 includes shipping/tax). For more than 40 years, SABR and its members have led the way in publishing the best baseball historical and statistical research. Our publications program is shifting to take advantage of new methods of publishing. Not only will we continue to publish new books like Can He Play? A Look At Baseball Scouts and Their Profession (released in December 2011); Opening Fenway Park in Style: The 1912 World Champion Red Sox (May 2012); Detroit Tigers 1984: What A Start! What A Finish! (December 2012); Sweet '60: The 1960 Pittsburgh Pirates (April 2013); Inventing Baseball: The 100 Greatest Games of the 19th Century (July 2013); Thar's Joy in Braveland: The 1957 Milwaukee Braves (May 2014); Detroit the Unconquerable: The 1935 Detroit Tigers (December 2014); Winning on the North Side: The 1929 Chicago Cubs (February 2015); and Scandal on the South Side: The 1919 Chicago White Sox (June 2015), which showcase the best efforts of SABR's members, chapters and committees, but new technology makes it possible for us to bring out-of-print titles like Run, Rabbit, Run: The Hilarious and Mostly True Tales of Rabbit Maranville (February 2012), Great Hitting Pitchers (March 2012), Nineteenth Century Stars (August 2012); Batting (January 2013); The Fenway Project (September 2013); and '75: The Red Sox Team That Saved Baseball (April 2015) back again. Books will be available in digital formats as well as paperbacks produced by "print on demand" (POD). SABR members will get discounted rates for all Digital Library publications, including many for free. If you're not a member, click here to join SABR. Stay tuned throughout the year for new (and old!) titles that we'll be adding to the SABR Digital Library. To learn more about SABR Publications, contact Publications Editor Cecilia Tan at ctan@sabr.org. This page was last updated October 31, 2017 at 7:24 pm MST.